Tour guides from the extreme left organization 'Emek Shaveh' to be paid by the Jerusalem municipality to give visitors free tours. The leftist organization "Emek Shaveh", that has fought propagandist and legal public battles against construction in Jerusalem, as well as against exploring to expose the city's Jewish and archaeological past, has a new partner - the Jerusalem municipality itself. The initiative of "Open House Jerusalem" (Batim Mibifnim) will take place this week, from Thursday until Shabbat. Visitors will learn about the past history of various buildings in different parts of the city, and the organizations behind this initiative are spread out over all of Jerusalem. Some of the organizations include the Israel Antiquities Authority, the Jerusalem Development Company, the Jerusalem municipality, and others. However, several of the guides participating in the Open House initiative are representatives of the leftist organization "Emek Shaveh." 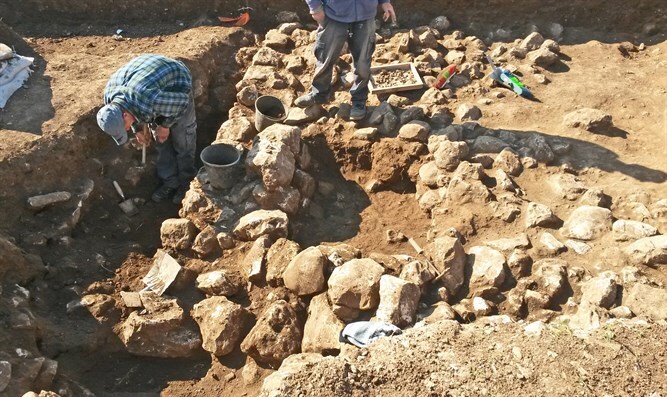 Emek Shaveh recently reported its battle against the archaeological activity in the City of David, as well as its legal battles against archaeological initiatives in Judea and Samaria, that expose the Jewish history of the area. On last Passover eve, the pro-Zionist "Lach Jerusalem" organization publicized a propagandist video from the Islamic Movement, which claimed that Israel is digging under Al-Aqsa Mosque. This claim, though untrue, caused several terror attacks during the past year. In the video, the head archaeologist of Emek Shaveh gives an interview, supporting the false claim that Israel is digging under Al-Aqsa. Lach Jerusalem expressed sorrow that, "during a beautiful project from the Jerusalem municipality, in which the treasures and enchanting houses of the city of Jerusalem are opened to the public, the extreme leftist organization Emek Shaveh is giving tours on the grounds of the Muslim cemetery in Mamilla (the site of today's Alrov Shopping Arcade, which is partially built on an old cemetery, ed.)." "Next to that plot of land, there is a museum being built, 'The Center for Human Dignity,' that Emek Shaveh has protested against. It has turned to the Israeli Supreme Court, claiming that Israel and the Jerusalem municipality are hurting the feelings of the Muslim community, in order to harm and to undermine their rights to [the land of] Israel." The CEO of Lach Jerusalem, Maor Tzemach, sees the participation of Emek Shaveh guides in this initiative as the epitome of absurdity. In his words, "that the Emek Shaveh organization, which opposed the building of the museum, will give explanatory guides on the site under the auspices of the Jerusalem municipality, [while at the same time] speaking against that same municipality - how can this be?" The Municipality of Jerusalem has issued a response regarding the "Open House" initiative: "The, 'Open House' project is an international architectural project, which operates in many countries worldwide. In Israel, the project is operating in Jerusalem and Tel Aviv." "As part of the project, hundreds of tours are offered, touring various houses in Jerusalem, while placing an emphasis on the architectural, archaeological, and academic aspects, and visitors are able to tour for free. The purpose is to connect the visitors to the architectural heritage of the capital city. The project has no political leanings, and does not identify politically with any of those taking part in it."